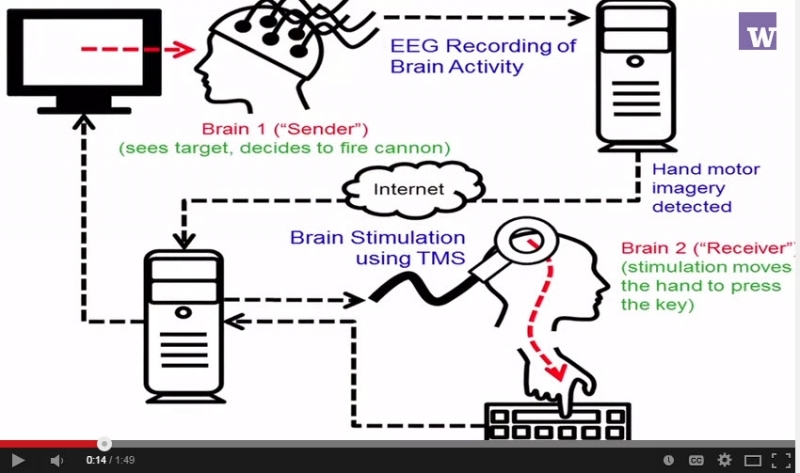 I remember dreaming that I was sending emails from my brain while I was asleep via a WiFi chip implanted in my skull. But that was just a dream. This is real. University of Washington researchers can transmit the signals from one person's brain over the Internet and use these signals to control the hand motions of another person within a split second of sending that signal. The research is a collaboration between the UW Institute for Learning & Brain Sciences, Computer Science & Engineering and the Department of Psychology. University of Washington researchers demonstrate how they can transmit the signals from one person's brain over the Internet and use these signals to control the hand motions of another person within a split second of sending that signal. The research is a collaboration between the University of Washington Institute for Learning & Brain Sciences, Computer Science & Engineering and the Department of Psychology. The researchers first introduced the technology in 2013. With new funding, they hope to expand the types of information that can be transferred from brain to brain.